The last indication is obviously a little more subjective, defined differently by different gastroenterologists. A 21 year old male was referred to me recently who had been admitted to the hospital four times over the past three months for bowel obstructions caused by acute flare-ups of terminal ileitis. He'd developed an allergy to asacol and was being maintained on Imuran (immunosuppressive medicine originally used in transplant patients). High dose steroid pulses were able to relieve the bowel wall edema for each of the prior hospitalizations but he came in this last time already on a high oral dose (60mg) of prednisone. The poor guy was at the end of his rope. 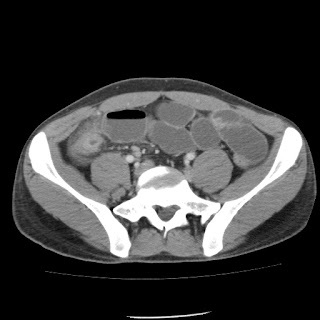 As the CT demonstrates, the terminal ileum was already starting to develop significant stricturing. We discussed all the options, but he was adamant; I want surgery. Surgical intervention in Crohn's is a double edged sword. On the one hand, you're dealing with relatively young patients who haven't developed significant cardiac or respiratory co-morbidities. On the the other hand, the effects of steroids go beyond attenuation of the inflammatory response. Wound healing is compromised. Infection rates are higher. Anastomotic leaks lurk. This was all explained to the kid and he agreed to proceed. I was able to laparoscopically resect the involved ileum and the cecum. Extracorporeally I did a two-layer hand sewn anastomosis (makes me feel better than staples). There was a transplant surgeon in Chicago where I trained who showed me a hand sewn technique he always used for his roux-n-Y cases. He said he never had a single leak out of hundreds of cases (despite a patient population of malnourished, immunosuppressed, steroid-infused patients). That was good enough for me. The kid is doing great so far. And he's thankful as hell. In our business, nothing is more satisfying than to be able to help someone who is truly grateful for your work. Unfortunately, however, this isn't the end of this kid's travails. For now, the disease is quiescent. But the monster merely slumbers. Where will it strike next? We'll meet again, I'm sure. Hopefully, not until many years in the future. Buckeye, what was so different about his handsewn technique? As opposed to stapling, I did a two-layer hand sewn anastomosis. Outer layer of interrrupted, seromuscular 3-0 PDS, inner layer of full thickness, running 3-0 PDS. The bowel in Crohn's patients is thicker, more edematous and I worry about staples tearing through. No science to it; just makes me feel better to do it that way. So the two layer make it less likely to strangulate the blood supply, right? Not necessarily. The outer, seromuscular layer simply reinforces the inner, full thickness suture line. Lembert sutures, I always heard them called. It's just a good way to buttress the anastomosis. Buckeye - did you do a lap fellowship. I can't imagine being comfortable doing a lap ileocecectomy fresh out of general surgery training (maybe that's because I'm a mid level surgical resident). I've done a few 3-0 PDS closures with the colorectal guys at my institution - both the seromuscular and full thickness layers are all running (4 running stitches - posterior Lembert, posterior and anterior full thickness, and anterior Lemberts. Sounds similar to what you did. That transplant guy isn't one of the Italian guys is he? Being comfortable with lap bowel cases is a state of mind. As a PGY-3 resident, you ought to be spending as much time as you can in the laparoscopic lab (inanimate is just as good.) The more time you spend practicing how to maneuver and sew laparoscopically, the faster you muscle memory will develop. It's amazing how well it translates to actual cases. Know the anatomy and be skilled. You shouldn't be afraid of any lap bowel case if you have those two principles down cold. Once I played 2moons, I did not know how to get strong, someone told me that you must have 2moons dil. He gave me some 2moons gold, he said that I could buy 2moons dil, but I did not have money, then I played it all my spare time. From then on, I got some 2moon dil, if I did not continue to play it, I can sell cheap 2moons gold to anyone who want. I think 9Dragons is my favorite game, I did not know how to play at first, someone told me that you must have 9Dragons gold. That he gave me some 9 Dragons gold, and then he said that I could buy 9 Dragons gold, but I did not have so much money, and then I played it in all my spare time. From then on, I have got a lot of cheap 9Dragons gold, if I did not continue to play it, I can sell 9Dragons money to anyone who want.